Impression Obsession Designer Challenge- I Love you Man! Good Morning! We have a super fun challenge at IO Stamps this week! It's the I love you man challenge!!!! My interpretation was to create a manly card from one manly man to another!!! This is the idea I had for the perfect "Bromance" Card!!! I started light to dark with Pool Party, Marina Mist and finished with one of this years in color inks, Dapper Denim! I used my Misti to be sure I got lot's of colour on the background!!! Finally, I stamped the sentiment, which also comes in the Super Cool My Friend Set, punched it with a label punch and mounted it on dimensionals. I totally LOVE this painted stripes background and can see a lot of different uses for it! 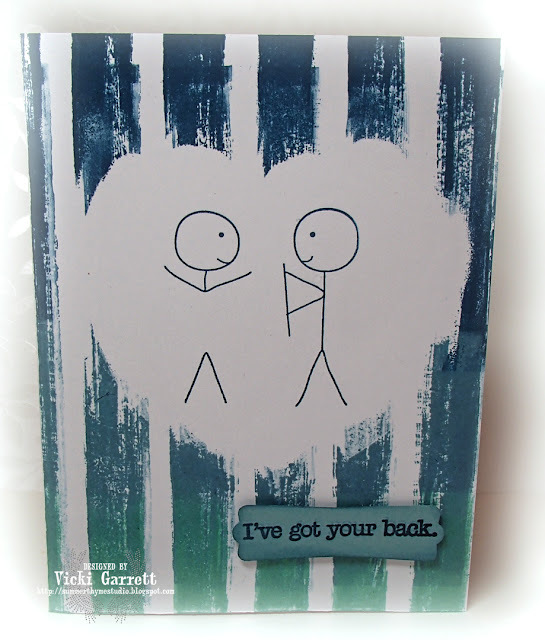 I figured the "I've got your back" sentiment was a pretty loving statement from one bro to another!!! I can't wait to see what you create for your masculine love card!!!! Check out the Designer Blogs to check out their fabulous creations! On behalf of Mom, Jonathon and myself, I’d like to thank you all for joining us today to celebrate Dad’s life. We are so grateful to our friends and family that offered support on this long journey. Dad was diagnosed with Cancer around the 18th of December. As most of you understand, cancer is ugly; the form of cancer that he was dealt, menacing and relentless. In real time four months isn’t all that long, but when you are witnessing and caring for someone who’s fighting that battle; each minute seems an eternity. Fortunately, we didn’t have to walk this road alone. From the wonderful palliative care team, to the friends who visited, called, assisted with his personal care, provided respite for us, baked and brought pies and sweets for dad, played music for him , drank a shot of scotch with him even if it was before noon we are grateful. To those for the care and help after he passed; cards, flowers, visits, calls and the team of wonderful friends with whom I’m been blessed to work with coming out to the house to help us out we are thankful. So many of you offered to help in any way you could; we can’t thank you enough. Not only did you lift Dad’s spirits and help to keep him comfortable; you carried us when we were weak. Your love and care for all of us was integral in allowing us to fulfill Dad’s wish to remain at home. He was happy to have visitors. Friends that he kept in touch with on a daily basis and some from the past. He was so very touched by the thoughtfulness of his nieces, nephews and cousins that travelled so far to see him. I’m sorry that I can’t thank each and every one of you by name; there are just too many of you. I fear if I did, the lights would dim, the music would cue and I”d be kindly escorted from the podium by a beautiful woman in a Givenchy gown. Lastly, thanks to Len and the group of gentlemen helping us with the celebration of life today; the folks at Tompkins Funeral Home and to Nancy the ladies of the sorority and the shrine for providing us with refreshments. Dad enjoyed his life. In his own words, he said he’d lived a pretty good 80 years. He loved people and was curious about them. He’d be quick to greet you with a smile, a handshake and an introduction…. Hello, I’m Ken McEwan…..and then the interrogation….erm questioning would begin. Where are you from, do you have any children and of course what about pets? Some might think this prying, but he was genuinely interested in people. Rest assured whoever and wherever you were, if you made eye contact, you’d be at the least graced with that smile, a robust “hello, how are you today” and he meant it. Many of the notes in the mountain of cards we received in the past few weeks noted how much you will miss his smile and good nature. I have many happy memories of growing up in Brighton where we moved when Dad got a Job at Warkworth Institution. On Sunday’s we’d take long drives down to Presquile or through the Northumberland Hills, good old country music playing; singing along. We’d stop for lunch or ice cream. When dusk fell upon us, we’d watch for the “evil eye” Unbeknownst to me at the time, it was actually Dad adjusting the headlights as the car approached the road signs. I always wondered why the “eye’s” appearance was always accompanied by a clicking noise coming from the floorboard. Those were pretty happy times. Mom and Dad always liked to entertain and spend time with other couples. Friday or Saturday evenings were spent playing cards and having a few cocktails. Unlike the later years when he’d urge his friends to stay for another drink, around nine thirty at night, he’d look over at Mom and say “Hey Sandy, we better go to bed, these folks might want to go home” I think he wanted a little alone time with the most beautiful girl from Pembroke. The tables turned immensely in the later years when mom would disrupt the late afternoon “Board Meetings” by abruptly telling dad to tell his partners in crime (hmmm Dennis comes to mind) to beat it and to get his backside into the house! Mom decided that it would be a great idea to increase our family activity and so we were off to purchase bicycles for all. Matching Purple CCM’s for Mom and Dad and a cool lime green number for me. Sunday afternoon fell upon us. It was a beautiful day and we three set off for the family bike ride. Out the driveway we went and to the right. We didn’t get very far, not even to the next corner and there was a collision. Mom still claims that Dad cut her off. All I remember is remnants of that heated discussion, Dad laying on the ground saying “ I scraped my hind wheels and me thinking , there’s only one wheel on the back of that bicycle. Needless to say that was the last time I ever saw Dad on a bike. Actually he preferred his cars and of course later, his trucks. The first year Dad worked at Warkworth, he left his cherished convertible with Mom in Pembroke and had some kind of a compact boxy number that he drove back and forth to work. I guess it wasn’t the most reliable, because one day he only got as far as Lake Dorey when the engine overheated. Needing a little water for the rad, he headed down to the lake and proceeded to fall in. I don’t think he kept that car too long. But he did say that it was about 12 beers from Kaladar to Pembroke. Not in this day and age! As some of you know, he’s had a few vehicular mishaps over the years. Mom shared the best one ever. He took my Grandfather’s Gravel truck to the gas station for a fill, doesn’t sound like a big deal, but he got the gas all right, Drove the truck off the lot, taking the Gas pump and all! As most of you know, Dad had a love for animals and they for him. We had many over the years and even if they’d arrived in our home with a name, or I’d been given the honour of naming them, Dad seemed to come up with his own moniker. One Sunday afternoon, the neighbours had invited us to go along to pick up a daschound as a companion for their pet. On the way home Clarabelle later to be known as (Dog and a half long and half a dog high) planted herself in Dad’s lap and that was it. She was Dad’s dog; there were no if’s ands or buts about it. Then followed Missy (Pj or Killer) Tonto (Trapper), Hercules (Herkemer) , Chinook and of course Sydney. Sydney was a great companion to Dad in the last few years. Each and every morning he’d call out “Come on little one, get your hat and coat on, we’re going trucking!” He trucked with her as he did with the rest, although by the time Sydney came around he’d learned that Whopper Juniors and Dairy Queen Soft Serve Cones are not good for dogs, so he’d settle on getting her a plain ‘Country Bit” with his coffee. The servers looking forward to their daily visits at the drive through. As I said, a great love for animals…..well except for my Rabbit “Happy”, who ate the top off of his cowboy boots……needless to say, happy lived out the remainder of his years in someone elses happy home! Dad was pretty good natured. In instances where I’d have Mom very upset over something that I did, Dad would remain calm. Nothing seemed to phase him too much, unless you took a pen from his pouch and didn’t return it. Then he would absolutely lose his mind. Red faced and sputtering, it was actually kind of funny if he yelled, because it was so out of nature for him. I think he’d get upset over his possessions as he worked hard for what he had; his work ethic very strong. I recall buying a ticket for a superlotto where the jackpot was 10 million dollars and telling Dad. “If I win, I’m going to quit my job” His response? Well you would have to give them at least two weeks notice, you wouldn’t want to burn your bridges”. Just as he didn’t want to retire, he didn’t want to expire. You may think some of my comments are light in nature given the circumstances, but that’s how Dad rolled. He had a remarkable sense of humour. It continued to shine right up until his final days. For instance, after telling Len (who he had been introducing as Kingston’s newest Baker) that he was not going to survive, he inquired if he would be the one to put him through the “shake and bake”. Good Lord dad. His palliative care team enjoyed their daily visits with him noting that his humour and good nature was refreshing. Each day they were required to ask him to rate his pain, to which he usually responded “3” even when we knew it was unbearable. On one particular afternoon when asked by Jacqui the expected question, he raised his middle finger and replied, under 100! There was more laughter than tears shed through all of this. I often think that humour helped us all to cope with the rapid deterioration of his health and for him was a way of deflecting the loss of dignity that one experiences when having to rely upon others to assist you with all of your needs. Mom and Dad. Together for almost 54 years. I often wondered how the hell that happened. She the yin to his yang, he the match to her flame, the detonator to her bomb. For the most part, he was the calm one; he called her chop chop. If you’re really interested in why, you can ask her a little later. They had a dynamic that often befuddled me, but through this journey I came to understand it as unconditional love. Mom, you had such strength in caring for Dad. Although he continued to test your patience at times, your love and attention didn’t falter. You’d still lose your cool and raise your voice occasionally, but one could still see the glimmer in his eye whilst he pushed your buttons. From the time I could speak, I would sing. I hate to admit it, but I was a bit of a ham when I was young and often when we had company, I’d be encouraged to entertain in some form. From my cowardly lion imitations to singing acappella I’d belt it out and dad and mom would beam. Adolescence brought some awkwardness, to which Dad bought me my first guitar. I taught myself (the many dollars invested in piano lessons made that easier) He’d say…..Vic, get out the git box and give us a tune… and so I did, and he beamed. They both presented me with many opportunities to sing publicly, performing the National Anthems at many Shrine and Beta Sigma Phi Functions, one of the highlights being at the RCMP Musical Ride in Kingston. I was blessed that he was so proud of me. During those last few months, I was thankful for my guitar and You Tube, where Jon or I could pull up Ralph Stanley, Flatt and Scruggs, Mac Wiseman. We’d sing along to those songs, he off key. Some of the music brought smiles, other songs evoked tears, but we sang ; that music kept our spirits awakened during his last days. One of Dad’s brightest moments was when Jonathon was born. He’d rock him and read to him; both falling asleep in the chair. 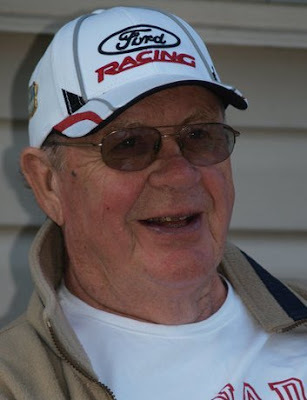 I can still picture Jon beside Dad in the truck, on his knee on the tractor, puttering in the shop, off to plowing matches or out to to look at the Petes and the Freightliners. As much as each would get frustrated with the other, the bond was strong. I know that he influenced Jon in many ways, more than he or I will understand. I know that he was proud of you Jonathon. And so here we are Dad, celebrating your life. I believe the seasons are representative of life. In an earlier piece for my blog, I likened you to a mighty oak, strong and stoic, your branches weakening as you weathered the storm, your leaves falling away one by one as you neared your winter. Winter came and it was time to go. You fought like a warrior, your community of friends and family fighting along with you. Your body defeated, your spirit remains strong. And now it is spring. Just as winter symbolizes death, spring represents new life, rebirth, new beginnings. Although you have left us in the physical sense, your spirit lives on. I sense your presence around me every day. When I was a little girl, we used to go and buy Mom a dozen roses for her birthday. After the flowers were wrapped and paid for, you’d turn to me with a big grin and say “Do you think your Mom can eat all of these”. I’d giggle and say to you, Oh DAD Mom doesn’t eat flowers! A few weeks after you passed, I was out in the small courtyard in my work area where we take the men out to smudge before program. I was showing the space to an Elder that I had just recently met . We were admiring the daffodils that were growing along the fence. Side by side we sauntered through the fence to go to another part of the yard, where there were random tulips growing up through the grass. She stopped quite abruptly. I turned to face her, to which she looked me straight in the eye and said “don’t you eat all those flowers”. Now who say’s that?? I told her that you had just passed and went on to tell her the flower story. She said “I wondered where that came from”. I smiled, my heart warmed and said, “ I know exactly where it came from”. There are many cherished memories we will hold dear as we remember your smile, your laughter, your humour (albeit not always politically correct). You will be dearly missed by many. but happily welcomed by those who have gone before you. As Spencer said on the day that you passed: "I know Ken has earned his wings; I’m sure he got to heaven, extended his hand and said Hello God, How are you"? Hello! Hope you're having a great week! This week's Designer Challenge is called Fanciful Florals! I bet you're wondering what the HECK my card has to do with that?? Well.....take note of the Flower on Beatrice Bun Bun's headband?.. Yep, that's one FABULOUS Flower!!! Actually, it was my intent to create a flowery card this week, but I have been busy trying to get things ready for my Father's upcoming Celebration of Life. I intended to share this card earlier in the week in the blog hop, but I hadn't figured out quite how I wanted to embellish it, so I'm thankful that it has one Fanciful Flower on it!!! I actually really like this sweet image!!!! I also really like the & Many More stamp by Kallani. I love the way she designs her graphics!!! I coupled it with the "Happy" clear stamp! Welcome to the Impression Obsession Summer Release Blog Hop! We have some beautiful projects to share AND PRIZES to give away! The hop will run for 2 days (5/2/16 – 5/3/16) with a list of participants on the Impression Obsession Blogs each day. Visit the fabulous Design Team Blogs on the list below (only one comment per blog per day please) for a chance to win one of TWO Impression Obsession Gift Certificates! Impression Obsession will be giving away a $25 Gift Certificates to two lucky winners! Comment entries (both days) will be open until 9pm EST on Thursday May 5th. All winners will be announced Monday May 6th on the Impression Obsession Blog. For my card, I used the Timeless Classic clear set by DK Designs. I watercoloured the truck image with Distress and Stampin' Up! ink, along with a water brush. To add a little extra dimension to the card, I stamped the Gears stamp on the corrugated cardboard paper and along the bottom, stamping off to get less Colour. I had a fun printed paper bag that I cut for the background, along with a smidgen of a patterned paper that I created with some Diane Reavely Acrylic Paint. Lastly I added some metal gears to up the manly factor! I'm sure my Dad would have loved this card! Be sure to leave comments on all the blogs! 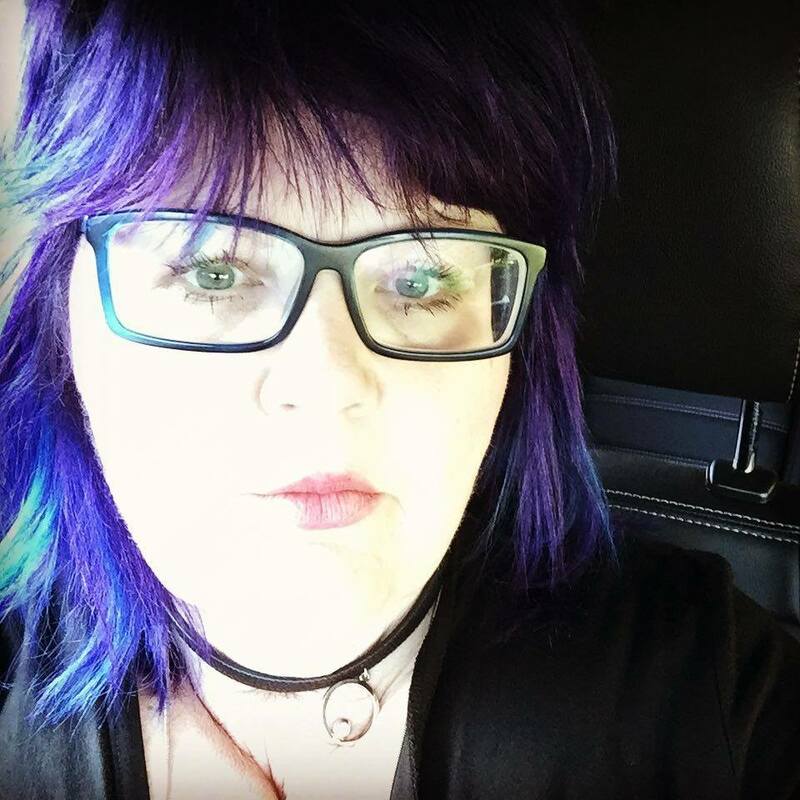 Impression Obsession Summer Blog Hop! 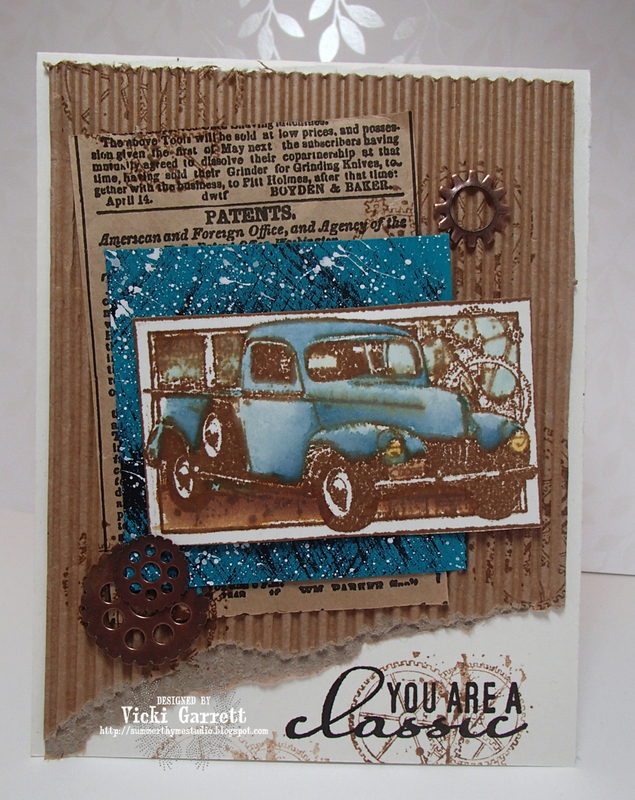 Welcome to Impression Obsession Stamps Summer Blog Hop! I can't wait for you to see all the completely and totally adorable stamps that Mitra has recently released and can be found under "New Products" on the IO website! 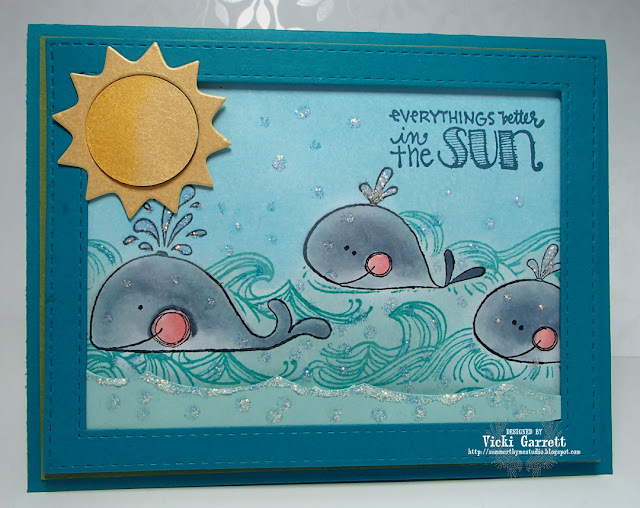 Water Waves, Wanda, the big guy Wally and the Everything's Better in the SUn sentiment. 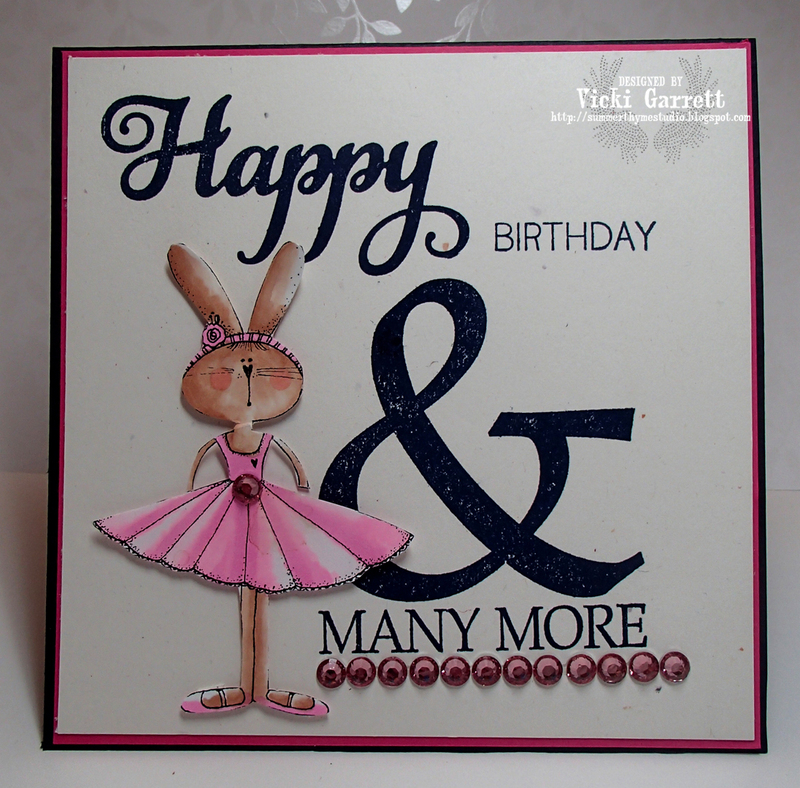 Of course I couldn't make a card without adding at least a couple of dies!